Welcome to the July edition of Style IQ, thank you all of those who got in touch after reading the June edition. Many of you had already seen the Fabulous Fashionistas I mentioned, and those that had not had a treat when they had a look! There was also quite a bit of interest in a Going Grey Gracefully dinner, so my suggestion is Wednesday August 12th at 7.30pm at the Italian on the corner of Parnell Road and Garfield Street Parnell. They offer a $15 evening meal. Let me know ASAP if you want to come along. Let’s Get Visible Ladies! Perhaps we could make it a monthly event, we are good when we are together. I have been busy this month with colour and style training, workshops and presentations. After talking to so many of you, it does not cease to amaze me how females select their clothing. I would say possibly up to 80% of you either do not own or do not use a full length mirror, my observation is “how can you know if you are fabulous” if you don’t look? You will also fail to notice that you have put on odd shoes or your dress inside out (both of these things have in fact happened to me!) it’s now a rule don’t leave the room without looking in a full length mirror! Check again before you leave the bathroom, most of us will have done this at least once, some more spectacularly than others. A close friend told me recently she trekked across quite a portion of central London with her dress tucked in her knickers! My second observation is “why would you buy it if you have not tried it on?” At a recent workshop the attendees were asked to bring along something that was just not working for them. Every single garment brought along, was bought without trying it on! In every case the offending item either did not fit, or flatter, some of them did neither! If you want to treat yourself with hard earned cash, enjoy the experience, take a friend or even better a stylist and try it on! My third observation is “only about 30% of you are wearing the right bra” So your clothes are just not going to look their best. Get fitted every time you buy a new bra, which should be at the very least annually. Throw them out when they don’t fit or pass them on to a charity. My fourth observation is that from our conversations and workshops, I know how hard shopping for clothing is. (I used to really struggle too). The invitation that sits on the counter to an important event, it scowls at you more everyday as you continue to avoid action. You know you have nothing suitable to wear because it’s been ages since you shopped, or the online shopping has left you with ill fitting unsuitable clothes, or your three sets of fat pants are just not going to cut it at the wedding! Make a plan, go and have a look around, wearing your best underwear try a few things on. Take a photo or two. Then go home and think about it. Did it feel good? Did it fit well? Did it flatter you? Is it suitable for the event? Can you afford it? Can you still afford it if you need new shoes and a coat or similar to go with it? If you have mostly yesses you are sorted run back and buy it! If not and you have done this twice, pick up the phone, stylists don’t bite, we are mainly fun, caring people who want to help. Often we can get you discounts and we know the wrong clothes (that you choose) in the end cost a lot more than the right clothes (that we find). Consider the cost per wear! 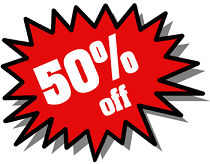 Final observation, lots of our high street stores are in sale at the moment, many of them offering over 50% off. Some of them are struggling. There are great clothes out there are great prices right now. Do remember before you buy online, these stores will vanish along with the jobs and the visual impact if we don’t use them. Identity is now in receivership! Hope to see you at the dinner please reply before August 1st! Such a busy month! New Color Me Beautiful consultants trained, fun workshops and personal shopping plus visits from my grandson. We are also planning a weekend of Style and Shopping in Auckland from Friday 18th to Sunday 20th September. Two nights in a Central Auckland Hotel with workshops on colour, style, body shape and personality. Presentations on Capsule Wardrobing and Fashion Trends plus a Day Shopping. All with the guidance of trained stylists. Seed is a new store in both Newmarket and Ponsonby, in Central Auckland. It’s an Australian brand and I am delighted to see it arrive here. I treated myself to a long woollen cardigan when they opened and I found a huge cowl neck sweater in their sale. The way the weather is going this year both items will be worn out by August! Every so often we get a significant birthday and later this year I have one. I think when you get one of these you have to re-establish your place in (your personal and the greater) universe. To put it simply I am not quite sure where I fit. The face in the mirror belongs to my mum and it does not match with the expectation of my mind. My mother was an older mum and she reached this point before the age of the internet and before the age of choice in fashion. Now, unlike her generation, the Baby Boomers no longer have a “uniform” or role for each decade of our lives. Therefore I do not have an immediate role model. This is both an opportunity but, at the same time, slightly unnerving. I started to look around to see what other women of my impending age and those older were doing. 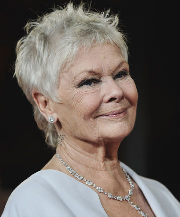 I see Merryl Streep (66), Dame Judy Dench (80), Dame Helen Mirren (69) and Susan Sarandon (66). These are all great actors on the big screen but even they say the roles for the older women are limited in their range and availability. If like me you are wondering about your place in the world, I urge you to take time to take a look at the lives of these women who decided there was more to older age than babysitting, retirement or waiting for the rest home. They all enjoy their work, families, and friends. They experience the challenges and changes that age brings and they all love life. They have also decided that they have something to give back, and enjoy not fitting the stereotype of the older women. One of them in her 90’s is a dance choreographer, another works in High Street fashion. One is a member of the House of Lords in her 90s, another now shops exclusively in Op shops. She could teach me plenty about dressing with style! One lady in her 70s has hopes to be a model. I would love to see her succeed. It is a shame that the ‘baby boomers’ are so many and probably have the money (well more than current generations) and some have time to offer more yet we are underrepresented in fashion, both clothing and advertising. There are few of us as heads of industry or in the front of politics. The older men are represented but not us. We are becoming Invisible as a generation! So many of my age group think it’s wrong to show their age, that allowing grey hair to show or wrinkles. Are we only in the ‘real world’ if we fight all signs of age and a long life? I find I am unusual in embracing grey hair and showing no interest in high heels and skin treatments. Despite being very conscious of what I choose to wear, I’m glad I got this far and I don’t want to go back and do it all again! I don’t want to fight the mirror forever. If that’s what it takes to be accepted I probably don’t want to be. I don’t know if any of you agree with any of my thoughts, but if you do, or would like to discuss other ideas, I would like to propose a “Going Grey Gracefully” dinner during August. Perhaps we can find a way to be Visible again. Or just have fun! Please let me know if you might be interested in this. Email me your name, area and the best night for you to have a meal out with like-minded women and I’ll set it up! 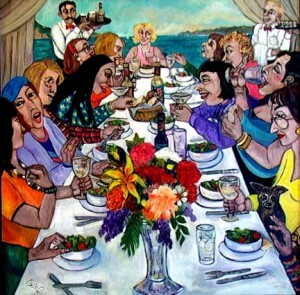 If you are not in Auckland or even New Zealand, and decide to organise your own dinner, let me know how it! 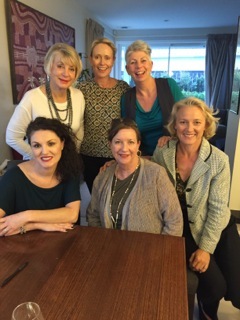 I have just been on a fabulous course, here in Auckland: I love my work as an Image Consultant because people fascinate me, they absolutely do. 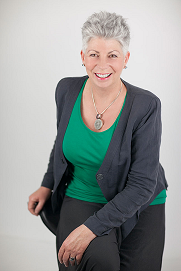 A few months ago, my good friend and stylist Sue Donnelly, who I had many a coffee and long chat with in the UK before we emigrated, announced she was coming to Australia to run a Facilitator Training Course for the personality assessment company she uses for her clients. Phew lots to say there! I thought, anything they can do we can do too. So I set about finding a group of interested stylists here. She arrived last week and we all met up on Monday. The result, shown below, after two days of driving Sue crazy, was that we all passed as accredited Clarity 4D Facilitators. This means I can profile you, once you complete a Clarity 4D Profile Questionnaire and then see how to best explain things to you about your style, how to pace myself when working with you and, to an extent, have a very good idea of what will suit you before we shop or work together. It should help both of us as I can try to match my communication style to yours, so that you get the most out of my time with you. The technique characterises you into four colours and I learnt that I am very yellow! This means I do everything very quickly with lots of ideas and enthusiasm, which I now realise may overwhelm you when we work together. The whole course was lots of fun and very thought provoking. For example, I know we all see things differently but trying to think and behave in someone else’s style was extremely difficult. Anyone with yellow energy will tend to buy clothes based on feel or touch and the promise of what wearing the garment will hold, very emotional. People with Blue energy buy on quality, cost per wear, longevity and practicality, so very much from a thought perspective. If you want to know your dominant energy, just let me know. I am sure there will be workshops on this valuable communication tool soon, but meanwhile, please get in touch if you have questions. On a different subject, there was lots of interest in the make-up information last month’s newsletter. This time, it’s choosing a lipstick. Large lips shrink with darker lipsticks, less full lips are plumped up by paler colours. 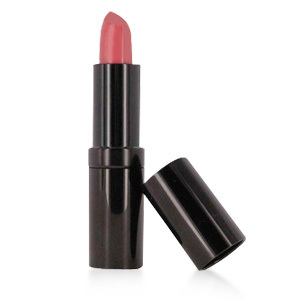 When you are choosing a new lipstick, apply the tester to your lips not your wrist, your hand or a piece of paper. As with a perfume, the colour will develop over 10 minutes or so, so don’t rush to decide. Also, if it’s a new colour for you, give yourself chance to get used to it. To apply lipstick, first pat lips dry. Then sketch a lip liner around the lip line of your mouth. Next, fill in the body of the lips with the same pencil. 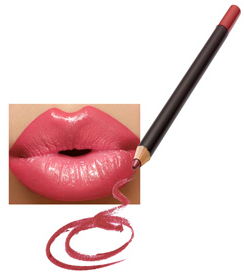 If you have time, or for a special occasion make-up, go over the lip liner with your chosen lipstick on a lip brush. If you are in a hurry, apply colour directly from the lipstick. Four lipsticks should be enough to go with everything you own. As ever, if you want face to face help, I have colour and make up classes running through out June and July. Please contact me. I am off to Melbourne tomorrow for what looks like being a very cold week. I look forward to bringing lots of new styling ideas to next month’s Style IQ Newsletter. Gosh finally got to write the newsletter and am amazed to have the log fire burning and be listening to the rain pouring down and the wind howling outside. The temperature has dropped to 11degrees. I was beginning to think this summer would go on forever, it seems to be months and months since I needed my waterproof to walk my dogs! So now I really am going to have to put the light fabrics to the back of my wardrobe and pull out a few long sleeves and thicker items. Last week I attended a wonderful new shop launch by Repertoire in Ponsonby. They are undergoing a rebrand and focussing on what they do well, flexible but feminine clothing. I have my eyes on a few new items, preferably not in black. I was also looking at a few great things from Kettlewell Colours in the UK I love being their New Zealand agent as it gives me really affordable clothing for my clients in great colour choices. More and more of my clients are asking how to choose a foundation, it seems a lot of women find it hard. So here are a few things to consider. Rule one, always test the foundation on clean skin (horror wearing no make up for this!) on your cheek or your jaw. Rule two, you are looking for the nearest match to your natural skin colour. So the best foundation is the one that blends in. Rule three, absolutely no testing on back of hand, over makeup, on at the base of your thumb. Join Moyra Naughton and myself on June 13th at 2pm for a three hour workshop of Colour Analysis and a makeup lesson! See the best colours for you and find out how to buy the right foundation colour and why some lipsticks work and some don’t. Email me at jill.cmb@gmail.com to book a place. 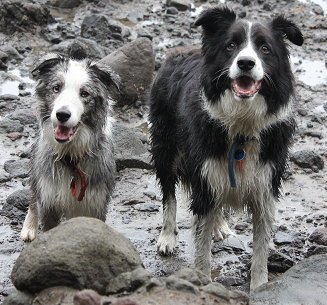 If you want to organise a group of your friends on another day we can come to you. Hopefully you all kept dry on the weekend, as Pam passed through. A reminder of how fast the weather in New Zealand can change and how flexible our wardrobes need to be! This season there is a huge amount of grey in the shops. This is wonderful news as it gives a softer look than the usual black, (which for most of us can be terribly aging). If you are a Deep or Clear Winter you will look amazing in black; if not, it’s likely you will look more attractive in some form of grey. Grey of course can be a light grey, a dark charcoal grey, a warm green grey, a cool blue grey, a sharp shiny grey or a muted soft grey, so there is a grey to suit everyone. As well as shade, it’s important to choose the right style too for your personality and body shape. Try adding accents of one of your best colours to grey to improve the colour balance. Earrings in your colour and the right lipstick, for example, can make a huge difference. Look at jewellery, scarves and shoes too. Don’t stick to black, it’s too harsh. If it’s a sheer garment, you can change its colour slightly by the colour of your slip. They don’t have to be only black or white. I would like to thank the lovely ladies that turned up to the “Conversation with a Stylist” evening heldin Repertoire New market, I put on with Moyra Naughton aided by Repertoire’s store manager Holly. We had a wonderful evening trying on the new season garments to see which pieces worked on who and why. We demonstrated how our individual colouring affects how good we look in our clothing. The whole room agreed that all three of us models looked so much better in the clothing, when we could find the colours as well as styles that suited us. The audience commented on how amazing it was to see how different each garment looked on each body shape, as the three of us modelled the new season garments. The three of us were very different shapes, proportions and heights, which really helped everyone there to understand how and why certain garments worked on one body and others did not. Based on feedback during the evening from our clients, Moyra and I will be putting on some more personal workshops during May. These will be whole day events for small groups, to cover colour, style, body shape and personality, using your own clothing. Each lady attending will receive a personalised workbook. If you are in Auckland and would like to pre-register your interest, please email me on jill@colormebeautiful.co.nz. If you are out of Auckland and have a group of ladies who might be interested in doing this, let us know. We are happy to travel to your area. Or look on the website for your nearest Color Me Beautiful Consultant. If you have any questions for me or topics you would like covered in a future Style IQ Newsletter, please email me. Most of us are reluctantly back to work after the wonderful summer weather. I am sure you, like me, are trying to soak up the remaining sunshine in the evenings or weekend before the autumn weather arrives. However the time is now here to decide on your clothing investments for the Autumn/Winter 2015 season. In the weeks since the last Style IQ News Letter, I have been busy with colour and shopping clients and last week training new Color Me Beautiful Stylists. 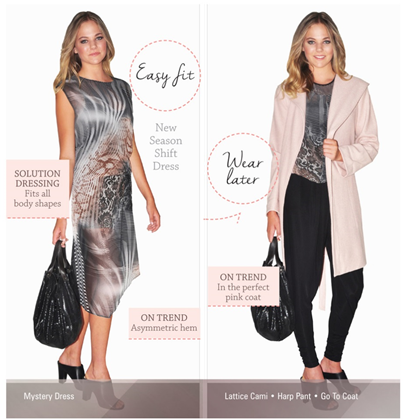 We have been absorbing the new trends and styles arriving in the stores, so it seemed a good time to discuss what’s out there for you! This season will prove to be interesting as one of the dominant winter trends is pastel shades! 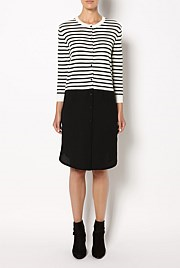 Over the last couple of seasons a major trend has been the drama of black and white together. This continues, however white has been joined by many shades of light to medium grey, pastel blues and baby pinks, a few shops also have a pistachio green and beige. The black side of the drama also continues but you may see navy or charcoal grey substituting for black. This is quite a powerful trend for colour and will cause a few problems for those with deep, muted or warm colouring. It’s really important to wear a colour that flatters you near to your face. At the same time you need to be careful where the colour change occurs to ensure you don’t draw attention to your less flattering areas. To keep up with fashion but not be a slave to it is important for those of us that shop to a budget and when the season colours and shapes are not too flattering it is always a challenge. Tip: It’s very important you use a full length mirror to check you look great in yoga pants or straight white shirts before you buy………….not afterwards. Think about what you want the garment to do, ask yourself the questions essential to good shopping, where are you going in it and what will you be wearing with it? If you think this might be too hard for you or you want a little help, I am putting on a workshop with Moyra Naughton, another CMB stylist. 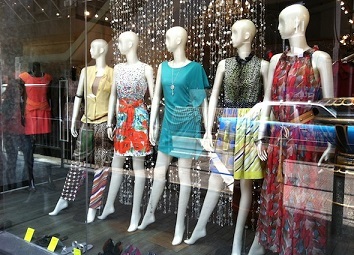 We aim to show you how to get a great wardrobe and how to choose well with this seasons offerings. If you are interested in this workshop or something similar, but it’s not in your area, contact Jill as we are looking to do a workshop roadshow throughout New Zealand. and learn what we talk about together, plus see the secrets of our wardrobes! Take a look at Autumn/Winter 2015 fashion offerings and get some ideas. Two hours of Stylish fun, and practical demonstrations to get you started on the wardrobe you always dreamed of. Lots of time to have fun and ask those questions you need answered about your wardrobe and your style! included tea, coffee and biscuits and a voucher towards a style workshop day with Jill and Moyra. Hope you can make our style evening, it will be fun and a chance to meet again. Happy New Year, I hope you each had a wonderful Christmas and New Year break. January being the start of the New Year is traditionally a period of reflection on the previous year. 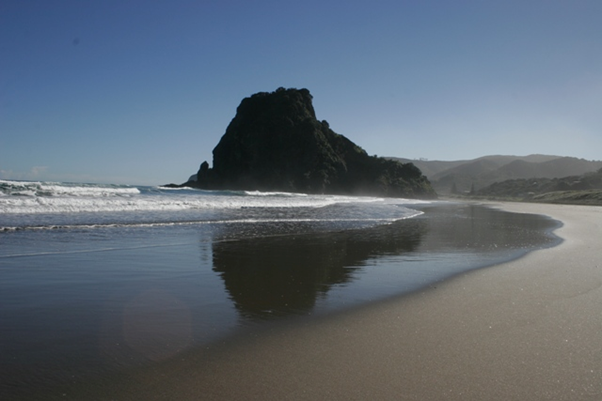 Despite a busy holiday with my family and new grandson, I found the time, when walking on the beautiful Piha beach, to reflect on what I have been doing over the last twenty years and perhaps more importantly, what I want to do in 2015. I hope you found the time for reflections of your own. In 1996, I trained as a colour consultant and personal stylist and I was lucky enough in doing that, to find my life’s passion. I found I truly felt fulfilled when I worked with others, to develop their confidence in themselves. At that time Image Consulting was all about Seasonal Colour Analysis, i.e. whether you were a Summer or a Winter, and teaching you how to wear a scarf in multiple ways! Over the years the view of Image Consultants has changed and so has the work we do. It is now more recognised as a soft skill which aids communication at both a social and a business level. The clothes that you choose to wear are part of the first impression you create. Poor choices in your clothing choice can create a poor first impression and can leave you feeling under confident. My professional role has evolved over the years such that I now aim to teach clients how to select clothing that helps them to be authentic. Authentic clothing is clothing that is in tune with you as a person, your values, your personality and your role and aims in life. Dressing authentically helps you to be better recognised and understood for who you are, by those you meet, and speeds up opportunities by opening the right doors for you, sooner. It also explains why some clothing can look good but not feel good. Authentic clothing always looks good and feels like home! 1. I train consultants to do what I do and be able to run their own style business (contact me to discuss dates). 2. I run one to one consultations to teach you how to dress authentically and what to buy (contact me for a private appointment, face to face or by Skype if you are not in Auckland). 3. I run workshops for small groups, see below for dates. Thursday February 12th 6.30pm to 9pm. Two places remaining. Wednesday February 25th 6.30pm to 9pm. Cost for each is $150, with a personalised work books included. Workshops will normally run with a minimum of two and a maximum of four. You are welcome to make up your own group and to suggest alternative times and dates. I am available weekdays during the day if that suits you better. 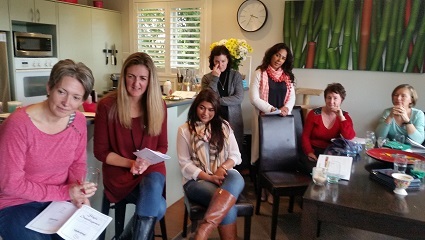 The workshops can be adapted for larger groups, as business rewards or as client packages. Please get in touch for details. The workshops are designed to be both fun and informative. The knowledge lasts a life time, the cost is a fraction of your wardrobe mistakes or annual hairdressing bill. Authentic Dressing is for all ages, both genders and size is irrelevant. It may even prompt you to start a diet, if you want to. I hope you know what you want to achieve this year and I hope to hear from you soon. The Colour for 2014 is……………..
January 13, 2014 5:37 am Comments Off on The Colour for 2014 is……………..
Radiant Orchid is a cool undertone colour and will suit those with cool colouring; Winters, Summers and Cools. 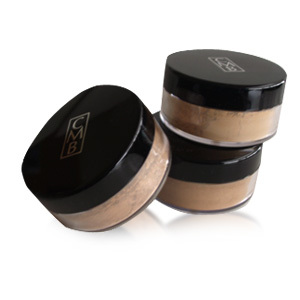 Put the colour near to your face and look in a mirror, do you look radiant too or washed out? If you look amazing in this colour and have the confidence, wear it on its own. Or try it as a blouse, top or jacket. It looks great with pinks or blues but can look very bold when teamed with red or green, it will lift your neutrals greys, navys and of course black if you are more conservative. If its not a colour you love but you can wear it, look for patterns that contain Radiant Orchid, or try nail polish, shoes, scarves or a fashion bag just to show you are on trend. If you have warm colouring and fall into the Autumn, Spring or Warm pallets, wear it away from your face, try it in shoes, handbags, pants. It looks amazing with orange, warm reds, lime green if you are dramatic or chocolate and khaki if you are keen to tone it down. Try to avoid wearing it with black as it can look harsh and dated. Of course Purple is a universal colour and can be worn by all in the right shades, I am sure there will be lots of versions of “Radiant Orchid so there will be deeper, lighter, warmer, cooler, softer and clear versions on the high street, look for yours! If you really are not happy in any shade of purple, look below at the other colours Pantone has chosen for 2014. Choosing the right garment and the right fabric for your style personality and body shape will be as important as choosing where to wear Radiant Orchid. The softer your colouring the softer the look you should choose, so try wool, velvet, tweeds, linens to balance you. If you are a clear with strong colouring try sharper shades in perhaps fabrics like, silk or satin. Remember your body shape and check in the mirror first! Other colours we will see will be an aquamarine type colour called Hemlock, a subtle blue green as opposed to the strong Emerald seen in last seasons clothing. A soothing Violet Tulip, the perfect antidote to the striking Radiant Orchid. A Dazzling Blue has been picked up by designers too with over 15% featuring it in new ranges. A soft Passive Blue is also heading our way along with a steely blue gray “Paloma”. For the warms there is Freesia a sunshine yellow and Celosia Orange a soft shade. Choosing the right garment and the right fabric for your style personality and body shape will be as important as choosing how to wear Radiant Orchid and its friends! These beautiful colours are also going to make a showing in the makeup shades this season, visit our Color Me Beautiful Shopping Cart and update your look. If your need help or advice contact one of our consultants or email Jill. On a trip to Melbourne last May, I visited the “Hollywood Costume” exhibition as it travelled around the world from The Victoria and Albert Museum in London. I was there for hours and hours and hours! I had not thought about it before but as soon as I started to read the words of the various costume designers in the exhibition, I realised, that I too am a costume designer. I don’t work with movie stars to create amazing characters, but I do help my clients to express their characters by selecting clothing that not only flatters their colouring, shape and proportions but also their personality! The costume designer’s role is to fix the characters in a film into the audiences’ minds as the director wishes them to be seen. In short the ‘good guy’ needs to look like a good guy, similarly with the bad guy and the heroine. The clothes they wear will create an idea in the audiences’ mind of who that character is and will make the actor totally believable and authentic in the role. Somewhere amidst all of the exhibits I saw that day was a remark made by a costume designer on dressing Meryl Streep for a role. 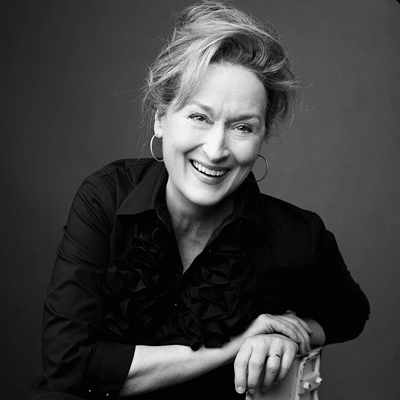 She said (along the lines of) “I design and create the costume for the role, once Meryl Streep puts it on we wait and wait and until a third person joins us, and the character arrives”! This is so true. We all make decisions about the behaviour and character of a person, based on the clothing they choose to wear and the way that they wear it. Colour, texture, silhouette and then movement and sound fix the character in all of us. TIP you may be a mix of types! You want clothing, makeup and hair to be easy to deal with and comfortable. You only wear accessories if they are practical; a scarf for you is to keep warm not to enhance your outfit. Fashion is of no real interest to you. You only want new clothes when the existing items you own can’t give you anything else. Key colours are earth tones and neutrals, not often black. Key words: relaxed, casual, easygoing and unpretentious. Esprit and Country Road will be shops to head to when you do your annual shopping dash! You like things to go together; you do not wear the jackets to your suit with anything else. Matching is important to you and your clothes are well looked after. You are quite traditional and are not keen to change. Clothing is simple and understated. Dress down Friday is hard for you. Key colours are navy blue, camel, white and black. Key words: conservative, traditional and elegant You will enjoy shops that offer well made tailored clothing. Try Jane Daniels. You like to feel feminine and are attracted to bows, lace, frills and jewellery. You probably have long hair and wear it loose. You enjoy heels and pretty clothes; you are not too worried about their practicality. Key colours are soft blue, soft pink and most pastel shades. Key words: womanly, soft and approachable. Pretty clothing catches your eye. You may enjoy October Reign or some of the Repertoire ranges, Alannah Hill, Laura Ashley may feature too as will Forever New. Clothes are important to you, it is important that they are noticed. You tend to buy stand alone items, often in strong colours. Your hair style and make up would be best described as strong too. Key colours are black, white and red. You will find Nicola Waite or Zambezi to your taste! Often Op Shop shopping appeals here as may Annah Stretton and Taylor depending on your budget. You know why it is important to be well dressed. Your look is current, but your own. It would fit anywhere; you invest in your grooming. You have a high quality stylish appearance. Key colours are white, cream and black. You will find the basic neutrals in most of the above mentioned stores work for you but try offshore for something restrained but individual. Most of us fall into more than one of these clothing personality types. If you understand your clothing personality you will select clothes that you feel good in rather than the ones you think you ought to wear. If you want help… get in touch!